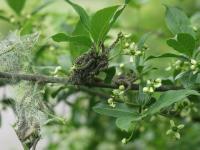 Just what makes a good hedgerow ? They may be ancient or historically interesting, or may be an important component of the landscape. Some hedgerows still have an important practical use in farming or as a boundary and today they have an increasing importance as a habitat for wildlife. Usually it is a combination of all these reasons providing tremendous interest and enjoyment throughout all the seasons. A CPRE pamphlet once described hedgerows as "the stitching that holds together England's much-loved patchwork landscape." Here is a picture gallery of some of the "best" hedgerows in the Horndean area, all reasonably accessible - my hope is that they will all remain for many future generations to enjoy and that wildlife will continue to prosper. Click on the images to enter the gallery and view the larger photos. 1. 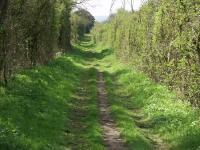 Bordering the "Ancient Lanes" (Ham, Coldhill, Tagdell and Crouch Lanes) are hedgerows rich in wildlife and Ham Lanes is bordered by strips of semi-natural "Ancient Woodland" with several of AW indicator species. 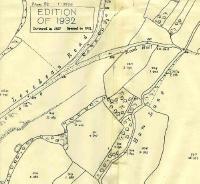 The map shows part of this area as it was in 1865 on the O/S and the picture along Ham lane is featured in the Horndean Village Design Statement. 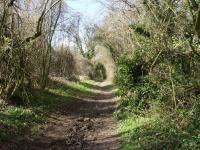 Guided walks along these lanes are held in May. 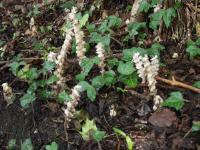 On the 2006 walk were able to see several clumps of Toothwort which here is parasitic on roots of Hazel. 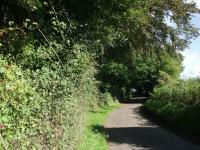 To the south of Tiplengreen Farm are wonderfully species rich hedgerows, accessible by a footpath from Hinton Lane to Lone Barn Cottage, one section forming a dark tunnel. Excellent 'corridors' for wildlife. 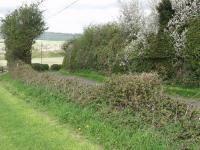 The hedgerows along both sides of Woodhouse Lane near Horndean's eastern boundary are well managed and in most parts have a good verge although the lane is fairly narrow and vehicles have to drive on to the verge to pass. 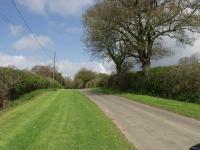 The small number of trees, oak and ash, are a valuable feature of this long hedgerow. 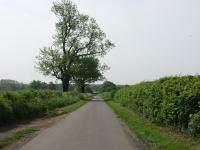 Crabden Lane that winds from New Barn Farm to Blendworth Church also has fine hedgerows but they are becoming fragmented in parts, with mostly good verges. 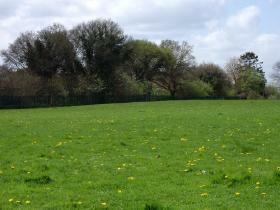 Are important part of character of Horndean, and hopefully will not be threatened by road improvements. The old hedgerows bordering an old path leading up across Horndean Down to the Windmill was one of the first to be surveyed. There is little left of the hedgerow on the west side but still provides a windbreak on winter walks. Good for butterflies, regular transects now carried out by volunteers. Some way up the path on the east side there is a good size walnut tree. 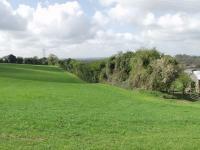 A large overgrown old hedgerow runs around the field sloping south, east of the 'clay-pigeon' shooting hut, west of New Barn Farm - great landscape feature where fields to the north and west are very large. The length of road that runs from the A3 to New Barn farm and beyond has some fine sections of mixed species hedgerow mainly on the north side of the road. Over 10 species including yew and holly. 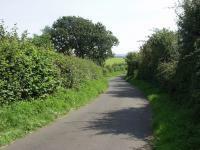 There are some good well maintained hedgerows bordering both sides of the Rowlands Castle Road on route east towards Finchdean. Seen from a car but beware of the dangerous bend near the oil wells. Some gaps allow roe deer to cross the road, several graze the field on the north side but it is best to keep your eyes on the road ! 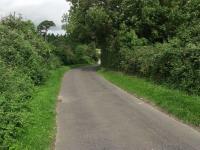 There is very little verge and a risk of road widening or providing sight lines. 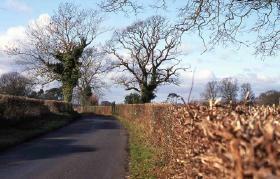 Further east there are a number of good hedgerow oaks which add character to the landscape. Hedgerow along the west side of Lovedean Lane, mainly hawthorrn with several spindle bushes. 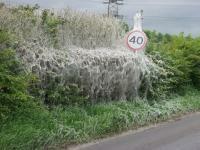 Survived an attack by the small ermine moth, a micro Yponomeuta species, millions of larva built silken tents and stripped all foliage in May but the hedgerow had recoverd by September. A bigger threat came from plot-holders wanting access to the field behind the hedge. 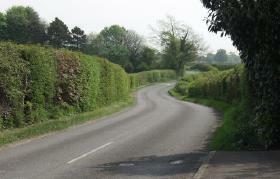 Some of Horndeans longest hedgerows run parallel to the north end of Lovedean Lane. 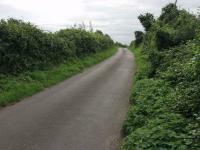 Last but not least, this is the hedgerow that started us off. 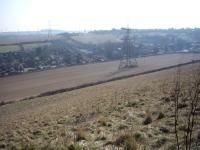 Once in the middle of fields and now surviving to become the urban/rural boundary. Originally the hedgerow (or row of trees) was surveyed in detail by the local tree wardens and was found to be made up of many native species including oak, field maple, hawthorn, holly, crab apple, ash, hazel, spindle, elder, sallow and at both ends elm. The HR is 240 metres long and at the Frogmore Lane end were the remains of one of the original elms, with a 42" diameter base and now there are a number of suckers still growing in that corner. The ground flora had many bluebells and ransoms, still a few surviving. 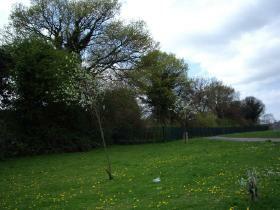 The hedgerow could easily have been a surviving relic of the original woodland. Now it needs more than 'paper' protection with railings on the north side adjacent to Jubilee field, and houses as close as they can go on the south side.